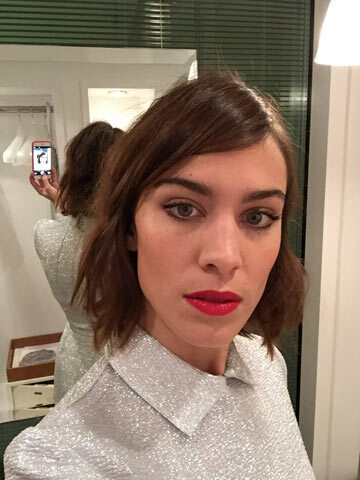 Alexa Chung looked suitably chic at the British Fashion Awards 2014 in London on Monday night. While her Emilia Wickstead dress may be a coupla thousand pounds out of our budget, her make-up look starts at a VERY purse-friendly £12. 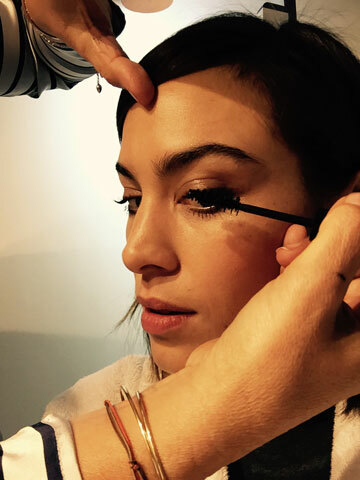 Better than that, the celebrity make-up artist behind Monday night’s look – Liz Pugh – has shared the duo’s behind the scenes secrets with Now. Come, join us in getting ready for a very spesh night out at the British Fashion Awards. Kinda. Liz said: ‘I wanted to go for a soft pretty eye with Bambi lashes to complement. It was all about fresh glowing skin, defined eyes and a strong lip. 1. To start I gave the skin a glow using a mix of serums and moisturisers and added a little concealer where it was needed to even out the skin. 3. Then I added the Eyeko Making Eyes Automatic Gel Liner in Pitch Black so close to the top lashline it became part of the lashes, this way it accentuates the eyes without looking like a liner. 4. I then chose a lighter champagne shade – Eyeko Me & My Shadow in Taupe – on the lid, using my finger to blend, giving a soft pretty sheen. 5. I next filled in the brows using the Eyeko Brow Liner and brushed them into shape with the Brow Gel. The Brow Gel is fantastic for making the brows stay in place without stiffening or flaking – perfect for red carpet events. 6. The lashes were a crucial part of this look, so I curled the lashes as always and then applied Eyeko Eye Do Mascara to the top and bottom lashes. It’s the blackest black which never looks dusty grey in pictures and it stays put – perfect for red carpet. Then for added effect I used Alexa’s favourite corner lashes from the Eyeko Lash Wardrobe. 7. To finish off and add a pop of colour to contrast the eyes, I gave the cheeks a pretty glow using Tom Ford Cheek Colour in Flush and used Nars lipstick in Jungle Red on the lips. What’s that? You want MORE! Calm down Oliver. Now has also wangled a video guide to help all of us nail the perfect liquid eyeliner look just in time for the Christmas party. Huzzahs all round.